The creative agency YG has once again surprised the sector with 4 prize winning projets notable for they diverse design techniques. 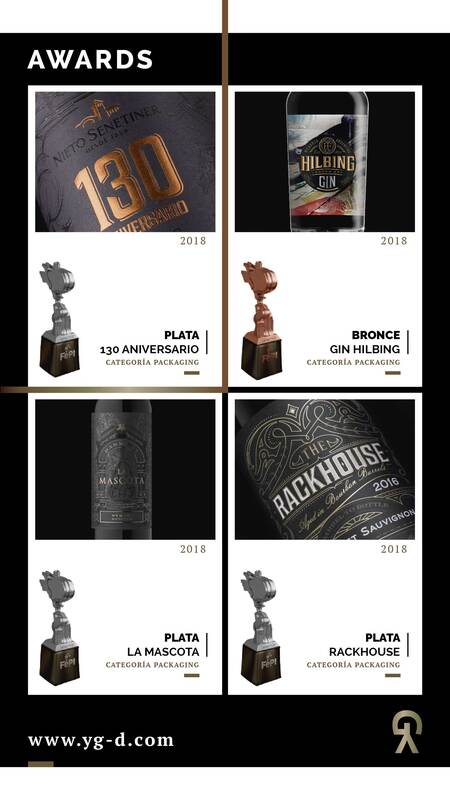 The designs, described below, have recently been awarded prizes in the packaging and illustration category in the Festival Internacional de Publicidad Independiente (FePI). Hilbing, the first Argentinian Malbec Gin, recognised word-wide. This drink is aimed at young consumers, so the client, want it to stand out, but without abandoning the design codes for spirits. Sebastián Yañéz, director in YG, explains that "Hilbing is a modern gin, striking, individual and abstract. We took advantage of the phonetics of the brand name and we gave a more European air to the label". Talking to the label, he stresses "the die stamping of the from label, its colours, typefaces, and the seal design are in line with aesthetic codes for spirits. Meanwhile, the back label as a different complexity and artistic form. The labels come to life, when you pick up the bottle, you see the artwork, it becomes complete, expanded, generating a 3D lends effects. The Malbec variety is represented here with its violet tones together with colours, each representing a botanic". La Mascota Dark Bat was designed for Mascota Vineyards, and was launched on Halloween. The client required an elegant, attractive and mysterious packaging. "Our inspiration came front the bats that represent the brand identity and live around the winery, that enologist considerers his friends" comment Yáñez. The illustration on the label, which was awarded a prize last year in the CLAP competition. 130 Aniversario comes from Nieto Senetiner. On this project, YG director comment: "It was a challenge to display 130 years of history without falling back on an image that would be perceived as outdate. Thats why we decided to recount the life of the winery using up-to-date modern art. We used a freehand illustration, narrating the history from the viewpoint of its founders". Rackhouse is aimed at the USA market. The client required the use of decorative motifs. In this case, Sebastián explains that "we used wreaths and frames in a centralised layoud, with a certain air of spirits labelling. The look and feel of the artwork is elegant, and has a high impact in sales displays". About the innovation, Yáñez comment: "we have a great capacity for adapting to the needs and requirements of brands, and also to generate a new styles. In our industry, innovations is a constant, so we must always be seeking new ideas, to incorporate them an adapt them to our needs. We like to keep up to date with world wide tendencies and the tendencies of particulars markets. We work side by side with our clients, who are surprised by our methods and procedures, which go hand in hand with creativity and good design". YG is working on a new project called MoonDesk, a software application intended to seed out design processes. A tool to facilitate management, modification and review of back labels. On another level, YG has specialized in reports on analyses of brands, design and label styling, intended for the marketing teams in wineries. The task is to understand with styles are used in the labels that work best in the market place, according to their price segment and to attempt to determine with products are growing most in these markets. A few weeks ago, YG participated in "Winning mentality" in Pentawords Conference, in the Packaging Innovation Madrid show.